So clearly I’m single but I’d like to use my blog for a second to defend what most of my friends do as their careers- be a housewife or a stay at home Mom. 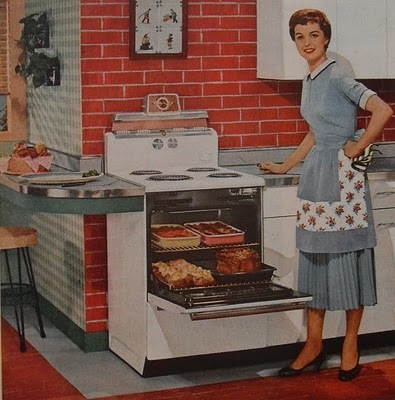 In recent years the term housewife has gotten more media coverage but not in a good way. In fact, it has kind of gotten dragged through the mud. I’m afraid most people today think of prima donna’s who throw lavish parties and have cosmetic surgery. Between Bravo’s Real Housewives franchise and Desperate Housewives the term almost has no meaning any more. Housewives...hmmm. This was the most modest photo I could find. When I was growing up I was fed a different impression. Women like Claire Huxtable on the Cosby Show had 5 children and yet were lawyers with perfect bodies of course. Seemingly a woman could do it all (Growing Pains and Family Ties are other examples). This was the illusion of the 80s- that you can find a super meaningful career and raise a family at the same time. The idea of being a stay at home seemed dull and unimportant. I can’t think of a job where you don’t do the same thing every day. Think of someone like Angelina Jolie. She seems like a real glamorous person living an exciting life. Have you ever heard about how a movie is made? It is taping the same shot over and over again from different angles until it is perfect. I am not saying you have to stay at home to be a good mother. How would I know about any of that? I’m a single woman. Every woman must make choices with how they want to live the life God gives them. Just understand that whatever you decide will be boring and repetitive a lot of the time. Any time in your life you can have a career you believe in despite all the tedium and fatigue than you have it made. Most of the housewives I know can say, even with all the stress, they believe what they are doing has value and matters to the future of the country. Most people can’t say that about their jobs. Why do you think there are so many shows like The Office about the stupefying tedium of the corporate workplace? Its what a lot of people live. I lived it for 3 years and it was awful. In this economy people are lucky to have any job without worrying about a dream job and indeed many women can not chose to be a stay at home Mom and must make other career choices. Regardless, most jobs are 80-100% boring, repetitious, hard work, so if you can find something you believe in and can do you as your career, you are a very fortunate. Maybe the problem is most women in the past didn’t have a choice to be a housewife or not. The customs of the era insisted they stay at home and with rare exceptions most followed. I don’t think this is the case any more or it shouldn’t be. Most women today chose to stay at home and raise their children a certain way. And like I said to have a job that you believe in and have chosen is a very lucky thing. In the past there may have also been a stereotype of a housewife as an indentured servant instead of a mother/wife. Hopefully this isn’t as common any more (although I’m certainly aware domestic abuse and violence still exists). At least nobody I know is treated so badly or forced to stay at home. “the basic messages expressed in these blogs —family is wonderful, life is meant to be enjoyed, celebrate the small things — are still lovely. And if they help women like me envision a life in which marriage and motherhood could potentially be something other than a miserable, soul-destroying trap”. I don’t have my dream job. I’d love to get involved in politics and make a difference in some small way to my community,and it may happen someday. However, my job allows me to fulfill my other more important dreams such as the open water swims. It allows me to work despite my pain (a HUGE blessing!) and to have the lifestyle I love. I consider myself very lucky and watched over in my career. I think anyone is lucky when they can lead a life of their choosing that fulfills them most of the time.